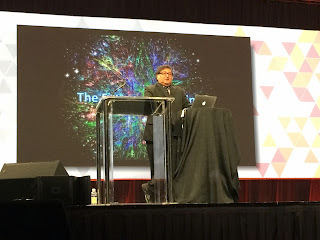 These are my liveblogged notes from the second keynote at ATD 2015, happening this week in Orlando, Florida. Forgive any typos or incoherencies. 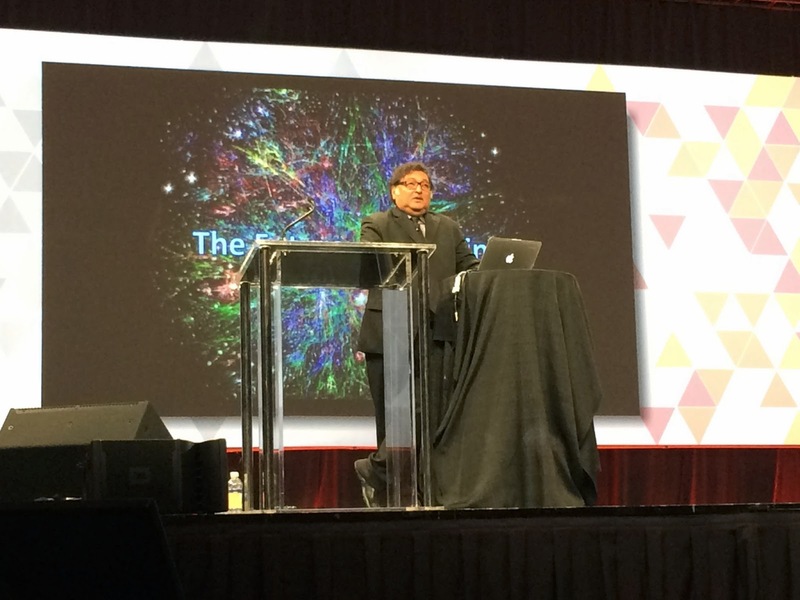 Sugata Mitra is Professor of Educational Technology at the School of Education, Communication and Language Sciences at Newcastle University, England and winner of the 2013 TED Prize. Known for the "hole in the wall" experiment. We are coming from a world -- the recent past -- where we did not have phones, computers, rapid transport. That was the world of thousands of years before the world of the last 100. How did that world operate? How did we develop people in that world? We hard horses and buggies and we were driven by a driver. Then we had cars and we became the drivers. This was a big shift and enabled creative things to happen, like drunk driving. We needed to develop soldiers -- people who could take orders and could be replaced with each other. We needed to develop people who could sit and take direction, not ask questions (sitting at the desks), the Factory workers -- to stand at the same spot and do the same thing over and over again. We needed them to not be creative. How did we create these people? There was a machine that ran that world for us. The school. Its job was to produce those people. "Schools enabled empires. They are now obsolete." All the tools we used to have -- slide rules, cameras, maps -- they went into the mobile phone. One day our grandchildren will ask us, "What is driving?" Not just things, even concepts, dematerialize. One day our grandchildren will ask us, "What does KNOWING mean?" That world is really close. What happens if you give access to children in the slums to a computer? The hole in the wall project. He created a do it yourself computer in a concrete box 3 feet off the ground. People hadn't really seen computers before. "What is that?" And he didn't say "that's a computer". He said, "I don't know." 8 hours later they were browsing and teaching each other how to browse. There was NO teacher. The children taught themselves. People couldn't believe this. "There's something inside there that thinks!" The results -- unsupervised children, when given access to a computer and the internet can go in 9 months to the same level as the average office secretary in the west. He says, "I'm glad trainers are laughing and clapping at that." He used to teach people how to use computers. The children had discovered a search engine -- their homework was perfect. They were quoting Harvard Business Review in their assignments. This is not learning, he thought. It took him a decade to understand he was wrong. This was the first attempt by the passengers to drive the car. The children figured it out. They downloaded an Oxford Dictionary with a speech component. They typed in a word, listened, and practiced until the speech program understood. The learner had developed the pedagogical method. This is not what he would have thought of. "Groups of children, using The Internet, can learn anything by themselves." The method of the grandmother. Stand behind them. Say "wow, that's fantastic. How did you do that? Where did you get that from? When I was a child, I couldn't do anything like that." The children respond with "Oh, you're stupid -- this is easy. Let me show you." It's a method very different from the parent or the teacher. The grandmother's method using admiration as the driving force to start each learning cycle. So now he has created the granny cloud. British grandmothers with webcams who get beamed into remote places. They don't teach, they just admire. "The presence of a friendly mediator can improve self-organized learning." It works, and results improve. But we have one problem: assessment. The government assessment program assumes you will NOT use any assistance of any kind. No calculators. No Internet. This came from a time when you could not carry your library on your back. 100 years ago an office looked like rows of clerks, following instructions. This is what an exam hall looks like...Those employers are dead. Why are we preparing our children for that world? The office today looks more like the hole in the wall -- people around a computer. Shouldn't the examination look more like that? That's the world where our children will be working. "Use your head. Use your computer. Talk to each other." We have to unschool people. "Allowing the Internet into the examination hall will change the entire system." The questions will need to be different. The curriculum will need to be different. Take the hole in the wall, take the granny cloud, take the SOLE -- put it all together and you get the School in the Cloud. With his TED Prize money, he created 7 of these. Over a 3 year period, where did the children take themselves? Today they are 1.5 years into it. The classroom looks like a business class lounge for children. Computers and places to sit together. On the wall, an Xbox. The teacher had to be more interesting than the Xbox. You drive the system with a question. "Why don't our teeth grow back a second time?" - 40 minutes later the kids come back with a lot of amazing information about gum health. "It's not about making learning happen. It's about letting it happen." Your next billion they are going to be explorers, hunter gatherers. They can carry the entire body of knowledge in their pockets. That's what we need to prepare for. The edge of chaos. Emergence. A completely organized systems is too much; chaos is too much. But if you bring them together -- nature's way is to operate on the edge of chaos. 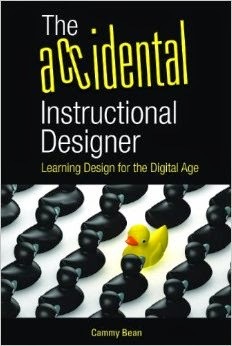 "Learning can emerge as spontaneous order at the edge of chaos." Your talent will come from the edge of chaos. What's next in the world where what you teach today becomes obsolete tomorrow? Knowing is NOT the most important thing. To be able to FIND OUT is more important than knowing. Skill education has changed completely. Students watch YouTube to learn how to erect a scaffold. A day later they are up two floors on their scaffold. We have to prepare the workplace to drive the car. At the edge of chaos, you can't predict where it will go. But it always goes somewhere. When my now 30 year old son was 3 I took him to Montessori school, occasionally I stood by and watched. There was a teacher, but there was far more exploration and experimentation. The children remained very engaged in tasks, and when they lost interest or completed the task, moved on to something else. I see alignment between that learning environment and the hole in the wall project. To me, the point of the experiment is that the role of the teacher is not so prescribed as its been all these years...so yes, similar to Montessori in that the children leads the process. Ravi, from what I understand of the project, there is no selection of children based on gifted or not. In fact, maybe part of the magic is that you have a classroom filled with diverse children supporting and learning from each other. Donald Clark pointed out that Mitra's Hole in the Wall, while an inspiring story, ended in failure. Thanks for sharing this Cammy. It was a very inspiring and thought-provoking keynote. Horses and buggies were great. The shift to cars enabled creative things like drunk driving. DUI convicts have to reveal about their conviction to prospective employers. How embarrassing! If you are seeking job in transportation sector or a job that requires driving, simply forget it! My sister is an intern with a Los Angeles DUI attorney. Let me know if you need any help.